The JORD website is full of so many beautiful watches. They not only do mens watches but they also have a womens range. 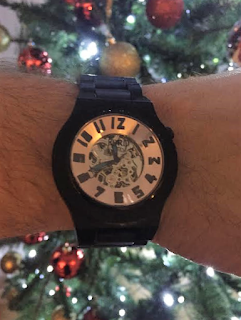 I must admit, when JORD contacted me I was very temped to get myself a watch as Hubby has so many but I knew it would be something he would really love so I chose one for him. The first thing that I noticed about this watch was the packaging. The JORD brand is modern whilst still staying natural and focusing on the natural materials of the watch so the fact that the watch comes in a beautifully polish wooden box fitted the brand perfectly. The box oozes luxury and elegancy and enhances the suspense of seeing the wonder that it holds. The watch itself is truly a thing of beauty. What struck me as soon as I saw it was the face. The Dover watch we were sent is an open watch meaning that you can see all of the inner working of the watch. The face incorporates the light steel of the cogs with the black numbers and a bright ring of genuine copper in a way that doesn't sound like it should work but it REALLY does. The attention to detail in the face of the watch is quite extraordinary and the photos really do not do it justice. This is a watch that really does have to be seen to be appreciated fully. The wood used in this watch is Ebony which makes it quite a dark looking watch. This really contrasted with the copper in the watch face and made a perfect pairing. Hubby liked the darkness of the wood too as it is only if you look properly at the watch that you see that it is actually made of wood not leather. This watch has been the topic of quite a few conversations recently with family and friends not being able to believe that looks so sophisticated could be made of wood. Hubby is completely enamoured with his new watch and it has taken pride of place as most loved in his collection. He has said that it is more comfortable to wear than some leather strapped watches he has and that it is the kind of watch he can happily wear during the everyday but that he can also wear with suits and for special occasions. This post was sponsored by JORD Wood Watches but all opinions and views expressed are honest and my own.